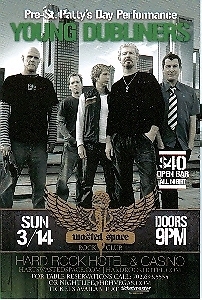 This promo card is for the Young Dubliners performance at the Hard Rock Hotel Casino, Las Vegas, Nevada, on Sunday March 14th, 2010. The Young Dubliners, is an American rock band, formed in Los Angeles, California (1988); their style of music: Celtic Rock. Card size: 4 X 6 in., in mint condition. Buyer is responsible for 1.00 postage within the USA and Canada. Send email if you need additional details about the card. Thank you for visiting our store!